Honestly, I spent almost all of the time that we were staying in Kalispell in Glacier National Park. There were a couple days when Going-to-the-Sun Road was closed due to weather, so I was forced to hang back and check out these towns. Was not disappointed! Our Airbnb was a great little house in the middle of town. Easy to get to everything and comfy for the two of us. The real difference between this and pretty much any other Airbnb was that this one had a climbing wall in the living room! Honestly, this was such a cool addition and I got to learn first hand how incredibly weak I am – especially my grip 😀 If we ever buy a house someday, climbing wall just might make the list of must-haves. Watercolor chakras. The home owner was a yoga instructor. Middle of the floor. Perfect napping spot! Living room climbing wall. Amazing. Since it was September when we visited I knew snow was a possibility. Luckily I only had to deal with gross weather for a couple days, which forced me/gave me an opportunity to explore Kalispell and head over to Whitefish. I hadn’t done much research on Kalispell, so I thought it would be suuuper podunk, but it actually turned out to be a really cute town with lots to offer. First of all, the outdoor retailers were incredible. No surprise there. What I didn’t expect to find were a number of cute, higher-end boutique style stores that sold fashionable outdoor clothing. My favorite, and what I would honestly consider a must-visit was Toggery. Cutest outdoor stuff I’ve ever seen. Extreme self control needed. My one planned and highly anticipated trip to Whitefish (a second, unplanned trip came later to buy new tires at the VW dealer after shredding ours on the road to Kintla Lake, oops) was to shop at Montana Shirt Co. I don’t know why, but I’m totally in love with this store. As a long time Instagram follower, I was pumped to finally set foot in their shop. I ended up grabbing a shirt, hat, necklace and hilarious onesie for my BFF’s infant. Little did I know that they have items in shops inside GNP, so I ended up with a few more pieces before my Montana adventure was over. 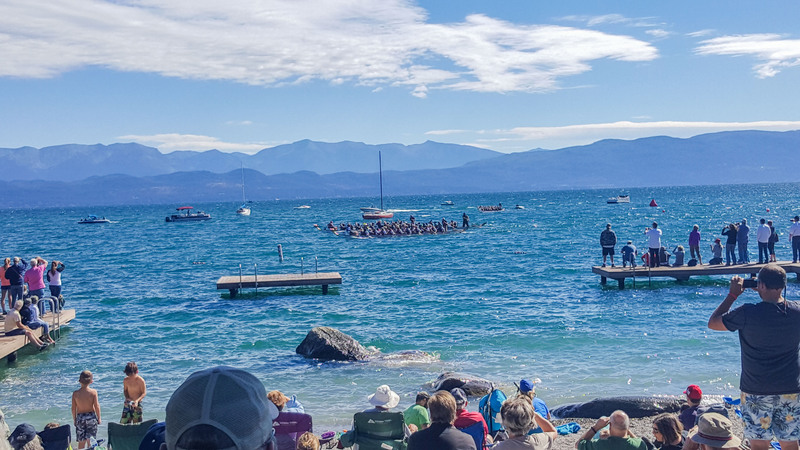 On one of our final days in town, we skipped Glacier and headed to Flathead Lake for the famous Dragon Boat Races. The weather seemed to have it out for the boaters. We arrived to see the last race before officials suspended racing for the day. High winds meant boats were flipping, which became dangerous for the rowers. Luckily no one was hurt and aside from the wind it was a beautiful day. To top things off we were introduced to “Bag of BBQ” which was just a scoop of delicious BBQ dumped into a bag of Doritos. Absolute genius.